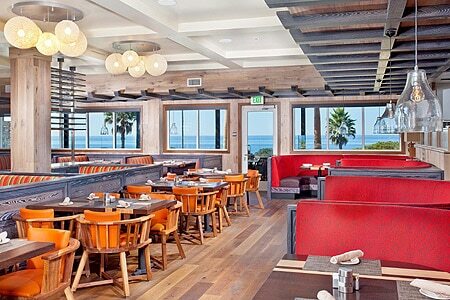 Ocean-view dining and coastal cuisine at Cape Rey Carlsbad. : Chef Teri McIllwain spins out creative coastal cuisine at Cape Rey Carlsbad’s signature restaurant. It's easy to kick back on the patio under an umbrella or by a fire pit and take in the view of crashing waves, surfers and sunsets while enjoying a craft beer or classic cocktail and casual gourmet bites. Inside, light woods and orange and yellow banquettes reflect the evening sky at sunset, a perfect time to partake of the Capeside poke with sashimi-grade ahi, quinoa, ponzu, Thai chili aïoli and marinated seaweed. Other alluring options include lobster nachos and porcini-dusted diver scallops on white corn purée. The beet and citrus salad bursts with fresh flavors from bits of grapefruit, orange and beets, all punctuated by blue cheese and pumpkin seeds in a blood orange vinaigrette. For something more casual, go with the Gouda and wild mushroom pizza or look closer at bigger selections like whiskey-brined Jidori chicken or Alaskan salmon roasted in ti leaf with a tomato-fennel marmalade. Carnivores will gravitate to the tenderloin with bacon-wrapped asparagus and garlic mashers. Lunch calls for lobster and shrimp tacos or an all-American burger. Brunch brings craft Bloody Marys, warm sticky buns and pork belly hash to the menu. McIllwain’s plates are both artful and taste-forward as she pushes the boundaries and delivers. Cap off any meal with the hazelnut mocha bar, a layered construction of hazelnut brittle, mocha mousse, house-made Nutella and chocolate genoise.